Although much of Mauritania is made up of the parched Sahara, most people depend on the land for their livelihood. In the south, along the Senegal River, hardy crops such as sorghum, millet, and peanuts are grown. During the 1980s, widespread famine struck when drought killed livestock and crops, forcing many people to move to the towns and cities. Today, the fishing and mining industries are being developed since there are plentiful stocks of fish off the coast and the land is rich in iron ore.
People of Arab and Berber origin (called Moors, make up about three-fourths of the population in Mauritania. There is also a large group of black Africans. Some Moors are nomads who herd animals across the country in search of pasture. Others live in cities or farm the land. From 1903 until 1960, the country was ruled by France. After independence, Mauritania claimed part of Western Sahara but later withdrew its claim. The main religion is Islam and the official languages are Arabic and French. Port de Peche is definitely a place to see while in Mauritania; it is a harbor craft and a fishing pirogue. The beach is full of these canoes, long and narrow, fighting to get in or out at sea. Sure, the smell is nauseating around, especially on days with more than 40 ° C. On a busy day, it is a chaotic place that is filled with laborers, traders, and fish sellers. The harbor is an incredible place where huge amounts of fish are landed by fine elegant wooden pirogues that get stranded on a private beach. You can find shellfish, lobsters, excellent snappers, that are all ready to cook. Port de Peche is a great place to get away and also explore its market. Despite the heat the fish are fresh. The fish of the day and the prices are not multiplied by three or four and the prices are negotiable like almost everything in Africa. Fishermen are allowed to leave fish waste near their fishing spot so if you can stand the smell, it is strongly suggested that you visit this wonderful place. A typical port where hundreds of boats come to unload their cargo and where a host of waiting middlemen and fish stall owners transport them, preparing, selling, completely run in joyful mess where you can feel the spirit of Mauritania, alive and at work. It is incredibly beautiful and full of emotions. Each person has their function and form a ballet on the beach, in the auction and on the road where you will see the women in charge of fish in wicker baskets placed on their head to head for the downtown restaurants to sell to them "treasures of the sea". When you enter this beach, you will see another activity; makeshift stands with women who cook freshly delivered fish to sell to fishermen and to all the people who work or hang out there. Frying smells, the noise of busy people, everyone is very busy, or train to sit back with a canoe filled with catches of the morning. Along the sea, perpendicular to the water, the boats, canoes, are out of sight. The show is impressive as they are parked thee; some are being emptied, others to be repaired, some shelter their occupants time for a nap. Get there on departure or arrival of tens of canoes, the place looks charming behind the organized chaos. if you want to understand a little more of everyday life in Mauritania go to the port in the afternoon, when they start to get a myriad of fishing boats; everything comes alive, carts pulled by mules arrive (or pulled by men, the less fortunate), the boats are hoisted on the beach by force of arms, there's also an exchange of money to buyers who bring home kilos of fish. In short, it s a site not to be missed! The Plage de Nouakchott is a clean ocean full of fish, white beaches, its pristine waters and a chance to have a view of the surrounding islands of Mauritania. There is a rich marine life and even small predators or dolphin and whale sightings. In one part, it shows the essence of Africa; wild, wonderful, lost, where at the end of the desert finally the beach, part of which is used as a port and fish market. The sea overlooks the Banc d'Argan, one of the fishing areas that are more 'exploited the world, a natural haven for many species whose rotting carcasses often rot on the shoreline. In its own way, it is a very unique place. The immense beach is popular here in Mauritania because of its almost white sandy dunes, great views of the Atlantic Ocean, and a nearby fish market that is dotted by handcrafted canoes of local fishermen. For those who like to fish, it is possible to buy fish from the back of the canoes. The return of the boats is a show that is really worth waiting. It has long miles of fine sand that are enjoyed by foreigners. The plage is a good place to relax while the ocean is too rough. Near the capital there are three bars on the beach with deck chairs and tents. Situated 25 km from Nouakchott anyone can reach the Sultana Beach by a sand road. You can see camels released to the surrounding, there are sun loungers and has provided tents for its location, you can eat at the hut where a good fish menu is served as well as refreshments. The sea is quite rough and there are two other beaches to check out namely; Pichot or Oceanides. In each of these places you will find tents, umbrellas, restaurant and bar for good leisure and tourists in foreign majority. 60% of the frequentation is indeed assured by French, American, German, Russian and Turkish. The rent for tents goes around for 3500 to 4000 or flat 2000 for the parasol, and you can pass a good time. Too bad it's here along the Atlantic, making it an area for surfers more than for revelers who want to enjoy the translucent waters. Beware: the currents are very strong. Choose to visit the restaurants by the sea and surrounding areas. The Sultana Beach is a quiet and simple beach next to the capital city. You can safely walk to the main street of the capital to get there. On the beach there are canoes because the fishermen work and catch fish on its waters. The boats are small but colorful and come in interesting shapes. However, most of these boats are very old. Next to it is a market where you can buy fish, but only raw. There are restaurants nearby and bars as well as a small grocery store. On the beach there are no facilities for tourists, but the water is clean and warm. A trip to this beach is mandatory if you stay in Nouakchott. Hidden behind high walls, the Centre Culturel Francais St. Exupery is like a small fortress. The activities organized by the cultural services presented here are really interesting. From music, theater, cinema, but unfortunately it is quite episodic. Part of the cafeteria is very pleasing and you can dine/have a drink outside and you can stay here for hours without anyone bothering you. There is a Wi-Fi connection and a courtyard where you can enjoy quiet moments alone. The setting is nice because you can eat on the terrace and the prices are reasonable. The restaurant stands adjacent to the Centre Culturel Francais St.Exupery. It is in the courtyard and where there is also a free exhibition of books lined along the alleys. If you come during the Festival of Music, you can witness great concerts at the French Cultural Centre and the Assalam Festival for ten days which shows different styles of music traditional, rap, and African. It is a place of cultural discovery not only of French culture but with other key cities of Africa too. There are exhibitions that rotate, shows and concerts for all styles, and informative film sessions. There is a children’s library and a documentation center about the country and more. There is a DVD library and a shop for snacks. You can see the entire program on the website. You can also have the opportunity to register online for discounted entrance rates. The Galerie Zeinart is where you will discover the impressive crafts and art in Mauritania. It highlights the craftsmanship of the locals and a chance to discover artists and creators from Mauritania and its sub regions. You must visit it while you’re in the city of Nouakchott - Mauritania. The art gallery has a very effective host in the name of Isabel who welcomes every guest with a ready smile and gladly answers any question regarding the art exhibit and the artist presented. She can speak many languages and does her best to accommodate the number of crowd that will fit the proximity of the gallery. 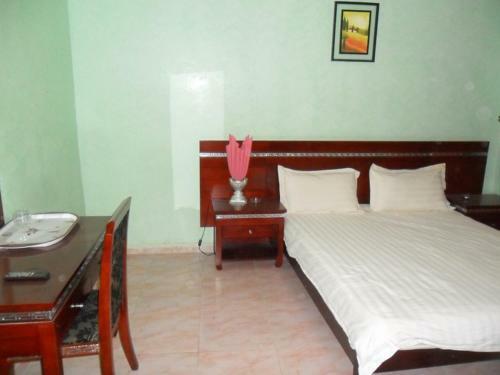 It is one the few attractions in Mauritania that you must not miss while in the capital city. The Marche Capitale is one of the most central markets of the city. Above all, there are clothes, the traditional boubou men, sails (melafa) women (which, incidentally, make beautiful curtains. You can order 1800 microns (5 Euros) for a sailing color that can be mounted easily to 4000 microns for a beautiful stain with many colors. For tunics, it gets complicated, because it is in between 4,000 and 80,000 Ouguiya (Mauritanian currency) and you have to know to recognize the quality. Aside from this the market sells, shoe shelves, kitchen equipment, fruit, vegetables, eggs and even across, there is a small Moroccan market (3-4 stores) that sell spices (opposite the seller of shoe shelves at the left side of the pharmacy). But the "local color" has to stop on the outskirts of the market where you can drink tea or for the more adventurous, taste some grilled camel meat. The fifth market offers fewer prices for these products, but you have to go by taxi or provide a good hour walk from the center. If you want to change money, it's in the capital market where you can have the best rates. It is a good market where they mostly sell the melafas and offered by the Mauritanian boubous women and men, as well as shoes and accessories. On a busy day, there is a lot of life in this market. It is very easy to reach as it is in the downtown area. Generally, you can buy anything at a good price, but you must haggle necessarily because the prices rise and cost more than other market places in Mauritania. If you are in search of a useful souvenir while exploring Mauritania, then the Marche Khaimas is the right place for you. The khaïmas is the traditional Moorish tent and it is sold here at a much lower price. Once you arrive at the market, you will be tempted to go everywhere, in every tent, to find the "most beautiful" tents. You can see all kinds of tents if you visit each stall here. You must also haggle with the vendor regarding the actual price of the tents being sold. You can check them out before buying too. There is a choice of unpacking tents (2x2 meters to 4x4 meters doubled patchwork with embroidery and external reinforcements or simple) and choose according to design and color. The seller may offer tea and you must take it and gently negotiate once the tent is chosen. 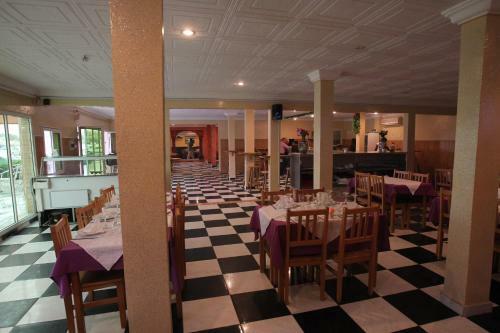 The TAFARIT Sun House offers an excellent local menu that highlights the best fish and meat in Mauritania. The restaurant inside is very well kept, the prices are good and in line with the life of the place. They have an extensive menu that undergoes changes weekly for that great variety. In each of the 3 categories they offer biodiversity, preparation, quality, and freshness. It is a leader among restaurants in the city and also in terms of flavor and portion size, it is extremely impressive. All prices follow the same price in the central region which guests find inexpensive. And for those who do not like fish; you can also order sandwiches, chicken, steak, pizza and other children's menu. The restaurant is run by a Lebanese. As it is often true with any Lebanese cook; the food is indeed good. The city of Chinguetti is located along the Dakhlet Nouadhibou Region and regarded as a sacred place to Islam. It is surrounded by an ocean of sand plateau. The Bibliotheque Habott is its only attraction. From the capital city, getting here is not easy. But in this part of Mauritania you will discover similar treasures which are all surprising and moving. The city is doing so much to preserve them. The Bibliotheque Habott has an impressive collection of 1,400 manuscripts that were all perfectly preserved. You must stop here to savor this ancient knowledge. With a guide you will have a better understanding of its role to the country. You can flick through the written pages that were meticulously hand crafted by the scribes of the eleventh century. A visit here is a must for anyone who goes to Chinguetti. Tako Restaurant is an excellent fine dining location with the best chef in the city of Chinguetti. If you fancy eating fresh fish and the best meat chops, this is the best place to have it. You can also spend an intimate dinner fir two if you come as a couple. The place is clean with friendly setting and great food. Highly suggested is to have an order of flat fish or other seafood products that are always fresh. This is one of the only restaurants that have a good reputation in Nouadhibou. Mauritania stretches to the horizon up to the beaches of Nouakchott. In fact, it goes from Nouhadibou north to Saint-Louis, Senegal to the south. One of the best parts of the country is called "the beach of the French," where a French holds a small restaurant on weekends (Thursday-Friday), where you can eat in the shade and with gentle breezes enjoy ultra fresh fish, lobster (alive and cooked in front of you) The only downside: Mauritania being what it is, Mauritanians do not mix between men and women, except families. Women bathe covered in their veil and men in bathing suits. The country has strong traditions and variety of attractions to see. It is a very beautiful country; and in the desert you have to go to sleep at least once, it's unique and you'd live extraordinary moments where you will feel the world is immense. At the sea, you could go during the day for sunbathing, the sand is fine as velvet, some are deserted and generally you will sometimes find during the weekend people renting a 4x4 to embark on a road trip. You can also go there for an evening swim because the water is always at the right temperature. It is not easy to make friends with the richest who are very reserved but the people here in general are very nice.